Hey! Today’s post is a bit random. E whom I live with ( aka my boyfriend) bought a jumbo pack of yogurts … He does not eat them and i maybe eat 4 or 5 a week, so there was no possibility of eating them all before the expiry date. So I got a little creative in the kitchen. I wanted something nice and fresh, an appetizer or a snack and here is how came the idea of this very simple fresh tuna dip. It is really easy to make and has a nice taste. It is not to sour thanks to the yogurt , but the lime juice gives the dip a nice twist. Just try it out! This dip is perfect for dipping veggies or to eat on crackers. A healthy protein packed snack. Perfect for dipping veggies. chop the parsley and mix it together with the other ingredients. Add salt and pepper , taste , add shiracha if you want a hot dip!! 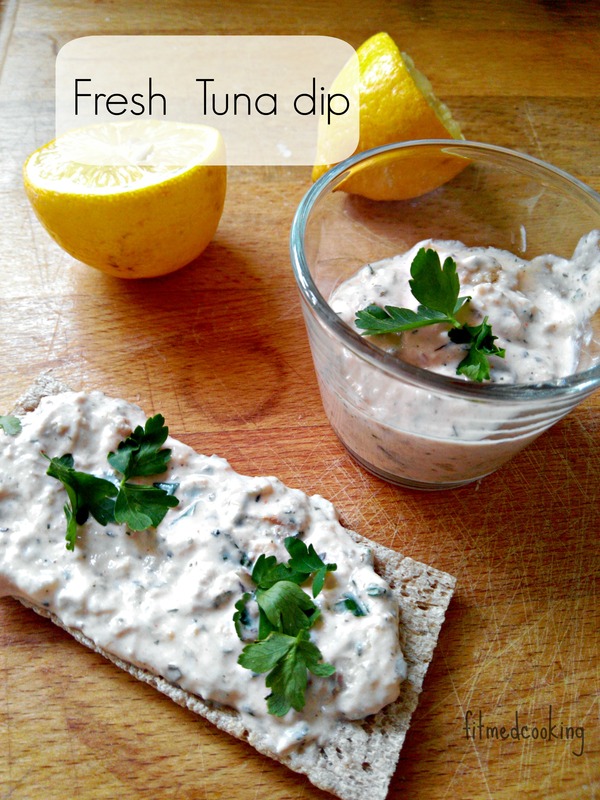 Place the dip in the fridge for one hour, it will allow the flavours to develop and this dip is best eaten fresh! WIAW : salads and pancakes!